Laura Hein (Ph.D., Wisconsin, 1986) specializes in the history of Japan in the 20th century, its international relations, and the effects of WWII and the Cold War. 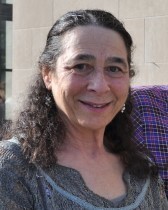 Much of her work focuses on debates over economic policy and the implications of various economic theories. Her 2004 book Reasonable Men, Powerful Words explores various ways in which economic expertise intersected with politics through a study of the lives of a tight-knit group of Japanese intellectuals. It was published in Japanese as 理性ある人びと 力ある言葉 ―― 大内兵衛グループの思想と行動. She also has published on economic policy, energy policy, and the ideology of economic growth in postwar Japan, particularly Fueling Growth (1990), which began life as a dissertation at the University of Wisconsin-Madison. She also has a strong interest in problems of remembrance and public memory, resulting in three co-edited books with Mark Selden: Living with the Bomb (1997), Censoring History, (2000, with Korean and Chinese editions), and Islands of Discontent (2003). The University of Michigan released another volume in 2010, Imagination Without Borders, centered on the work of a contemporary Japanese visual artist. Her current research is on Japanese local political culture in the aftermath of total war and political repression, which her historical subjects described as fascism. Laura Hein has won NEH, SSRC, ACLS, Japan Foundation, and three Fulbright research awards. She is currently the chair of the Northeast Asia Council of the Association for Asian Studies. She also is active as an editor and serves on several journals. Her editing projects include serving as one of twelve editors of the Asia-Pacific Journal: Japan Focus, a peer-reviewed, open-source, electronic journal and archive on Japan and the Asia-Pacific region, which includes over 3500 essays. Particular strengths of the journal include essays on the politics, economics, society, and culture of contemporary Japan, including the aftermath of the earthquake, tsunami, and nuclear disaster of March 11, 2011 and the history of Japan's international relations and war remembrance in Asia. The site also includes substantial coverage of Korea, China, Southeast Asia, the Pacific region, and the international impact of the United States. Readers located in over 180 countries access the site more than 100,000 times each month. Hein also is the main editor of a new edition of the Cambridge History of Japan, scheduled for 2020, and serves on the editorial board of Critical Asian Studies, an inter-area, interdisciplinary journal, as well as The Journal of Japanese Studies and the Journal of U.S.- East Asian Relations. Co-edited (with Rebecca Jennison) Imagination Without Borders: Visual Artist Tomiyama Taeko and Social Responsibility, Center for Japanese Studies, The University of Michigan, October 2010. Imagination Without Borders is accompanied by a website created by the Northwestern University Library Digital Scholarship Services. Co-edited (with Mark Selden) Islands of Discontent: Okinawan Responses to Japanese and American Power, Rowman & Littlefield, April 2003. Wrote introduction, “Culture, Power, and Identity in Contemporary Okinawa." Co-edited (with Mark Selden) Censoring History: Citizenship and Memory in Japan, Germany, and the United States, M.E. Sharpe, 2000. Wrote introduction, "The Lessons of War, Global Power, and Social Change." Korean edition in 2008. Chinese edition 2011. For information on Censoring History, visit Routledge Publications. A nice K-12 curriculum featuring this book is available at Columbia University's Expanding East Asian Studies page. Co-edited (with Mark Selden) Living with the Bomb: American and Japanese Cultural Conflicts in the Nuclear Age, M.E. Sharpe, 1997. Wrote introduction and last chapter. Also available as an ebook. For information on Living with the Bomb, visit Routledge Publications. Fueling Growth: the Energy Revolution and Economic Policy in Postwar Japan, East Asian Monograph Series no. 147, Harvard University Press, February 1990. Guest Editor of special feature, with my introduction, “The Territory of Identity and Remembrance in Okinawa,” in Critical Asian Studies, 33.1 and 33.2. January and April 2001. Guest Co-editor with Mark Selden and wrote introduction, special issue on "Textbook Nationalism in Comparative Context" Bulletin of Concerned Asian Scholars 30.2 (Spring 1998). Guest Editor, special issue on "Commemorating the Bomb: The Fiftieth Anniversary in the United States and Japan." Also wrote "Introduction: The Bomb as History and Transnational Memory," Bulletin of Concerned Asian Scholars, 27:2 (April-June 1995): 3-15. Hein’s recent articles include “The Art of Bourgeois Culture in Kamakura,” in Japan from 1945: From Postwar to Post-Bubble, eds. Christopher Gerteis and Timothy George, London: Continuum Books, 2013. “Raising Taxes for Democracy: The Japanese Policy Environment of the Shoup Mission” Co-authored with Mark Metzler, for Elliot Brownlee, ed., The Shoup Mission to Japan: A History of Transnational Tax Reform, Cambridge University Press, 2013. “Reckoning with War in the Museum: Hijikata Teiichi at the Kamakura Museum of Modern Art “ Critical Asian Studies, 43.1 March 2011 was reprinted in Art and War in Japan and Its Empire, 1931-1960, Louisa MacDonald, Asato Ikeda, and Ming Tiempo, eds., vol. 5 of series on Japanese Visual Culture, Leiden and Boston: Brill, 2013. “Revisiting America’s Occupation of Japan” Cold War History, 11.4, November 2011, 579-599. [Japanese-language version]. “Modern Art Patronage and Democratic Citizenship in Japan,” Journal of Asian Studies. 69.3 (August 2010): 821-841. Hein teaches several courses centered on modern Japan in its international context as well as World War II in Asia. She also teaches a Freshman Seminar on controversies over history called Museums, War Memorials and Commemorations. Her most recent new course is a senior seminar on The Atomic Bomb, which focuses on both Japanese and American perspectives. She is looking forward to team-teaching an interdisciplinary course in Winter 2017 with Professor Patrick Noonan of the Department of Asian Languages and Cultures on The Modern Japanese City. Hein edits a series of free course readers on various Asia-related topics created from The Asia Pacific Journal which are available at its website. As part of the East Asian History graduate group, Laura Hein trains students in modern Japanese history. She also regularly teaches a graduate methods course on Commemoration and Remembrance as Historical Problems. Please see the Graduate section of the Departmental webpage for recent information on students. 2015-2016 Centenary Fellow, SOAS, University of London. 2014-2017 Osaka University Specially Appointed Professor of Research(One month per year). 2012, Edwin McClellan Fellow, Yale University September 2012. 2011 Institute of Social Science, University of Tokyo Visiting Research Professor.